Roffman Miller Associates sees outstanding customer service as our priority and we take pride in providing personalized service and extensive client communication. 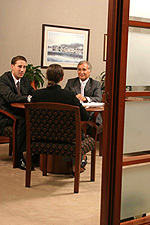 Conduct an in-depth client interview. Define a client’s goals, history, need for income and risk threshold. Build a comprehensive client profile. Evaluate the optimum investment strategy on an individual basis. Assess changing client needs and circumstances to make appropriate adjustments. Provide on-going communication via meetings, written reports and informal discussions. In addition to traditional money management, our team acts as a partner and counsels our clients on any financial questions or concerns.